*Update: International GSM version also received the Android 4.0.2 update by now. Download size is 8.7MB. Verizon released Samsung Galaxy Nexus barely 24 hour ago but I just found that they already released a software update for the ICS running droid within 2 hours of its official release. This update makes your phone firmware version to 4.0.2 from Android 4.0.1 and build number will be ICL53F. This update will improve your 3G/4G and WiFi connections, tweak the lockscreen somehow, and improve visual effects while using the front camera. The update size is 10.7 MB and is made available to download as soon as you activate your new device. I am hoping that same update will soon arrive at the UK version of Samsung Galaxy Nexus. International version is in the queue too. 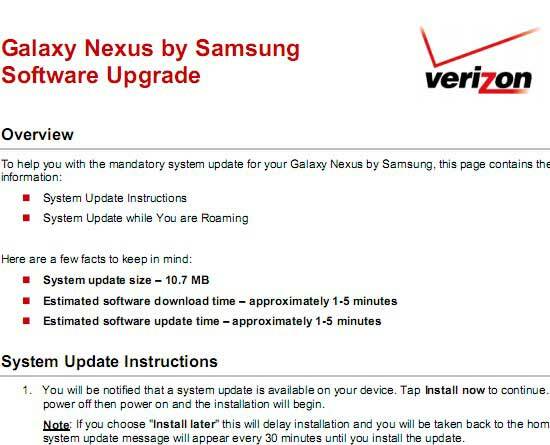 Click here to download the update instructions from Verizon itself.